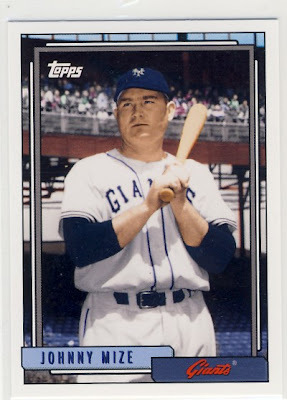 I do give Topps a lot of credit in doing a pretty good re-imagination with a brutal junk wax design but as in my review of #48, you can't really get me too excited about a new Johnny Mize card. Which brings me back to my comments about who qualifies as a legend. I ruffled some feathers saying that Johnny Mize really wasn't a legend and initially said Hank Greenberg might not be one either but I have walked back from that comment a bit. For me a "Legend" is more than just being a Hall of Famer...and more than being a 1st ballot Hall of Famer. And so I do find some fault with the players included in this set. I think I would have to turn in my card blogger license if I didn't. With all the exclusive contracts for some star players I realize Topps can't just include any player they want but a lot of the all-time greatest players [that really no one can argue with] weren't included and so substitutions had to be made. Two players are not found on either list: Pee Wee Reese and Thurman Munson. Johnny Mize only makes the SABR list at #87. I think we can partially excuse Thurman Munson for his career being cut short and so we are left with our two interlopers, Pee Wee Reese and Johnny Mize. and of course there are no Pete Rose or Joe Jackson cards available as well.